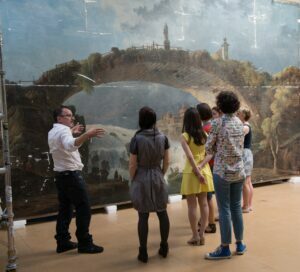 At over 20 feet in width, Le Pont Sur Le Torrent (estimate: $2-3 million) by the 18th century French master Hubert Robert (1733-1808) is one of the largest Old Master paintings ever to be offered at Christie’s New York. This vast painting, which depicts a wild torrent of roaring waters descending into a waterfall below an arched stone bridge, was originally commissioned by the Duc de Luynes (1748-1793) for the dining room of his opulent Paris townhouse. Subsequent owners include the American newspaper baron William Randolph Hearst, who installed the painting and its equally massive mate La cascade in his beachfront castle in Sands Point, Long Island. Though the pair was separated in later years, Le Pont Sur Torrentsurvives in its original state as a masterpiece of decorative painting with a dominating presence that is nearly cinematic in effect. The restoration project began in June 2014 and was completed and installed in March 2017, taking just under 3 years. The most significant aspects are the sheer size of the work and the many campaigns of restoration it had undergone before. The talk will focus on the treatment processes, including planning for the project, solvent and gel systems used, structural treatment, restoration and installation. Bill Mackinnon received a BA in Drawing and Painting from The Glasgow School of Art in 1980, before training as a Conservator with The Courtauld Institute of Art and The Tate Gallery (Tate Britain), where he was awarded diplomas in the Conservation of Paintings in 1983 and 1984 respectively. Bill founded WCM that same year and has over 34 years’ experience in the restoration of paintings and artworks as well as lecturing extensively on conservation, examination of artworks and care of art collections. Trevor Cumine will also be present to answer questions about his involvement in the treatment. Entry is free of charge to members of the BAPCR (but please email BAPCRsecretary@gmail.com to let Gemma know that you will be attending), and £10 for non-members. Wine and soft drinks will be available to purchase before and after the talk. PayPal – You will need an existing Paypal account or you can set up a new Paypal Account via paypal.com. When making payment, follow the instructions online. Click on “Send money” tab. Enter BAPCRsecretary@gmail.com when prompted. Please email Gemma Collins, BAPCR Secretary at BAPCRsecretary@gmail.com with your name and email address details when you pay for your tickets.